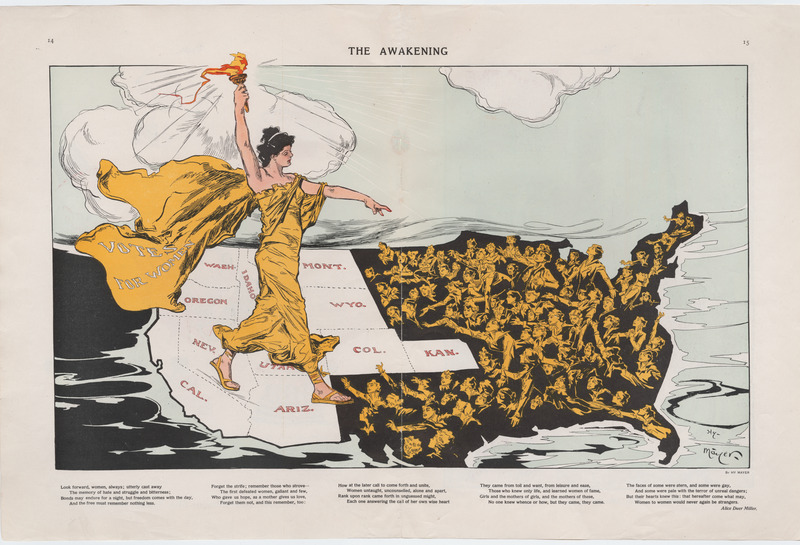 The most striking of the "suffrage maps," which played a major role in the successful fight for women's suffrage in the U.S. For details on the origin and use of the suffrage map, see Notes for ID #1193 "Votes for Women a Success". Lady Liberty, wearing a cape labeled "Votes for Women," stands astride the states (colored white) that had adopted suffrage. She holds aloft her torch, bringing "enlightenment" to women in those states still in the dark. The faces of these women are turned up to the light, and some reach out in hope. (Many have fashionably short hair and hats, reflecting the middle and upper class core of the suffrage movement. Dando 2010, 224). This map appeared in the magazine Puck during the Empire State Campaign, a hard-fought referendum on a suffrage amendment to the New York State constitution|the referendum failed in 1915, but was successful two years later. The illustrator was Henry "Hy" Mayer, a German-born artist who was Puck's chief cartoonist at the time this was published. Kahn 2014, 322. Below the illustration is a poem by Alice Duer Miller, a novelist, playwright, screenwriter, member of the Algonquin Hotel Round Table and "popular poet of tremendous range and skill." Chapman 2003, 1. Miller was an active and tireless feminist who produced a substantial volume of "defiant, witty suffrage verse." Ibid. 3. The collection includes a number of persuasive maps featuring the Statue of Liberty: ID #2309 (1875), #1091 (1885), #2125 (1885), #1109 (1890), #1176 (1915).